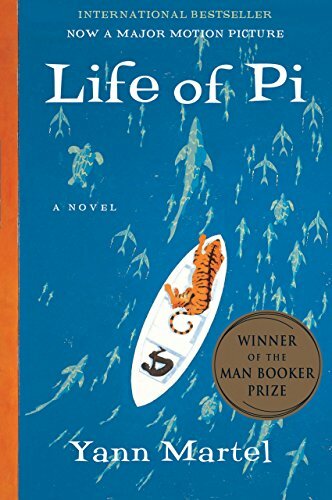 The beloved and bestselling novel and winner of the Booker Prize, Life of Pi. After the sinking of a cargo ship, a solitary lifeboat remains bobbing on the wild blue Pacific. The only survivors from the wreck are a sixteen-year-old boy named Pi, a hyena, a wounded zebra, an orangutan—and a 450-pound royal bengal tiger. The scene is set for one of the most extraordinary and beloved works of fiction in recent years. Universally acclaimed upon publication, Life of Pi is a modern classic. aharr1 (Grade: A) A story that caused a deep thinking on life and religion. Beautifully written with a highly satisfying ending. I highly recommend on many levels. WPslide (Grade: A) I enjoyed this book a lot. Pi is a wonderful mix of wanderer & wonderer. He is not perfect, before or after his adventure, but he is engaged in life. It would be fun to meet a person similar to this character. Live on, Richard Parker! Alerak (Grade: B+) An overall enjoyable tale that has rightfully become a popular piece of contemporary literature. The themes extend beyond an exploration of the human psyche into a deeper probing of what spirituality really is, and what it means to be human in our world. One of my new favourites. soccereagle542 (Grade: B+) Simple but endlessly fun, and surprisingly thoughtful. dre-conian (Grade: D–) This book is overtly a parable on why you should believe in god. That's it. Any debate about the ending or the story drivels down to religious belief. I disagree with the argument and I reject the premise. I groaned at the ending and groaned louder at the movie. I wouldn't waste my time unless you're looking for some religious afirmation in your life.